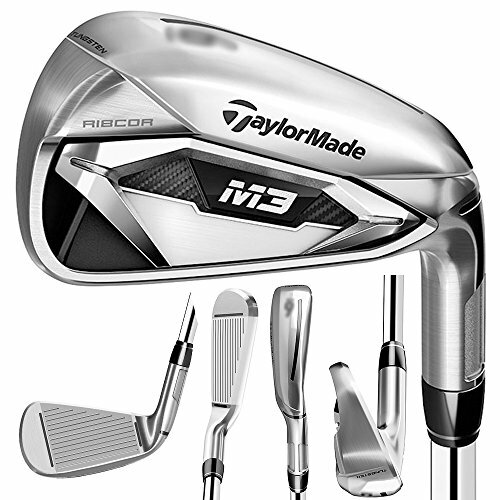 SERIOUS DISTANCE Packed with performance and refined to suit the better player's eye, M3 irons offer distance, forgiveness, and control for the serious golfer. INTRODUCING RIBCOR TECHNOLOGY A breakthrough innovation in irons performance; RibCOR is designed to help you hit it LONGER, HIGHER, and STRAIGHTER. RibCOR localizes face flexibility, transferring more energy to the ball to increase ballspeed and promote straighter shots. SPEED POCKET Speed Pocket technology improves low-face flexibility to deliver more ballspeed in the key area where golfers commonly mis-hit. FACE SLOTS Face Slots enhance face flexibility in the heel and toe areas to preserve ballspeed on mis-hits for greater consistency. TUNGSTEN 15-gram tungsten weight optimizes CG placement for improved launch and stability.